AK-47 is an unflavored tobacco blend of dokha. This flavor is classified as a "over-warm" strength Dokha. The strength refers to the intensity of the nicotine buzz. "Cold" would be low strength, while "X-Hot" would be the highest strength. "Warm" strength is somewhere between the two. Note: Dokha Tobacco can contain up to 5 times as much nicotine as is found in a single cigarette. We do not recommend Dokha for anyone with a high sensitivity towards nicotine. Dokha is dry tobacco and should only be smoked out of a Medwakh pipe. Dokha should not be smoked in a hookah pipe. 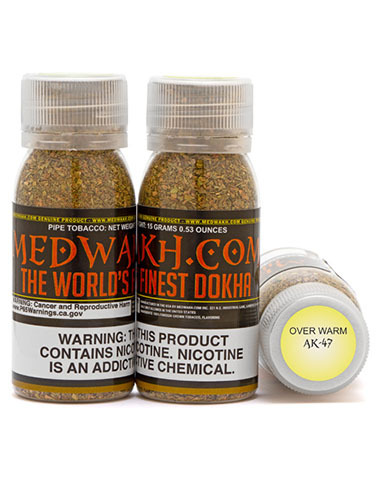 AK-47 Dokha Traditional Tobacco has a average rating of 0 stars out of 5 stars based on 0 reviews.